Over the past few years there has been a huge push across the country to reduce health care associated infections (HAIs). This has created a big market for entrepreneurs. In fact, according to BCC Research the market for HAI prevention products is expected to be $14 billion by 2016, at which time the market for antibiotics to treat HAIs is expected to be only $6 billion. Some hospitals have purchased high-tech hand hygiene monitoring devices that use radiofrequency identification, some have installed video cameras to observe hand hygiene, while others have invested in hydrogen peroxide robots. At my hospital we're investing in coat hooks. As we prepare to roll back contact precautions (i.e., no longer requiring patients with VRE or MRSA to be isolated except in special circumstances), we thought it would be good to re-visit bare below the elbows to reduce clothing contamination and promote good hand hygiene. Several years ago, our infection control committee endorsed the bare-below-the-elbows concept. This means short sleeves, no neck ties, and no white coats. We specifically crafted our policy as a recommendation not a mandate since we believed there was enough evidence to recommend this intervention but not enough to require it. It was an intentional soft sell. Since the recommendation was made we have seen more physicians in scrubs, and our nurses are nearly all in scrubs. We still have the issue of long sleeves under scrubs when the weather is chilly, and we still have many doctors who just can't ditch the white coat. 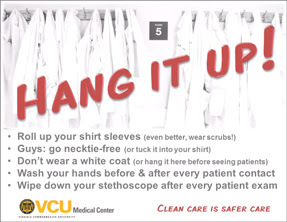 So our latest effort, the "Hang it up" campaign, is a little more pragmatic, giving healthcare workers more options to comply with bare below the elbows. We're placing coat hooks in all physician team rooms and nurse work rooms with a poster (the physician poster is shown below) asking healthcare workers to hang up their jacket or white coat before going to see a patient. If a male doctor feels compelled to wear a necktie, we advise him to tuck it in his shirt. We would have preferred to have coat hooks placed between patient rooms on wards, but fire regulations wouldn't allow that. As I have said before, the longer I work in infection prevention, the more I believe it's a behavioral science. Old habits die hard, so the next few months should be quite interesting to observe.